The obvious benefit and sought after benefit of learning how to flip real estate is the profit. Making money is one incredibly tangible benefit of learning how to flip houses, particularly when the profits are large and quick to come your way. Of course there are risks. Most ventures that offer high profit also come with a high degree of risk. 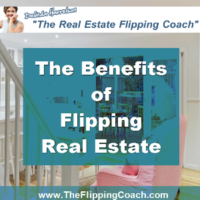 Money, however, is not the only benefit that can be associated with learning how to flip real estate, though it is certainly the one on most investors’ minds when they get into this line of work. Let’s talk about the profit that comes from learning how to flip real estate first. Profit is the one reason that most people get into this business. The days are long and the work is hard. This is definitely not the type of work one would ordinarily undertake for the simple love of getting one’s hands dirty. Flipping real estate is real work that leaves you bone weary at the end of the day. However, when all the work is done and you get around to making the sell, you will find that the profit involved in a successful flip is well worth the effort you’ve put into the process. The good news is that the savvy investor can still manage to make money even when the situation may not work out quite as planned. This is yet another benefit to learning how to flip real estate. If the flip doesn’t work out, there is always the option of leasing to own the property or renting the property out. The profits in these situations are considerable less than a straight out flip but it can prevent financial ruin that is often the risk of a flip gone wrong. The fact that there are options and that you aren’t necessarily left ruined at the end of a bad flip is definitely a benefit. One of the intangible benefits of learning how to flip houses is that you are in essence working for yourself. In other words, you do not have to punch a time clock or worry about overtime (at least not on your part). This can be a bad thing too if you lack the discipline required to get the job done. However, most of us will view this as a huge check in the plus column when deciding whether or not to take the plunge into the wonderful and frightening world of real estate investing. Even though this is a business that requires a lot of work in order to turn an attractive profit there is some satisfaction at the end of the day involved in knowing that you are working for yourself and not to make someone else wealthy or in order to punch a time clock. That feeling of satisfaction is one that you should hang onto when the brand new toilet you’ve just installed becomes a geyser. Of course, there are mistakes along the way, what other job keeps you on your toes quite like this one? Real estate investing, house flipping, in particular, can be one of the most frustrating types of investments a soul can pursue. At the same time, it can also be one of the most rewarding mentally, spiritually, and financially. All of this is something you should keep in mind when deciding whether learning how to flip real estate is the right path for you.